The main challenges posed by the installation of heat pumps in existing multi-family houses are the required high flow temperatures – specially to comply with health regulations with regard to domestic hot water – and the limited availability of adapted heat sources in the surroundings. A promising solution for the renovation consists in installing so-called bivalent (hybrid) systems in which an electric heat pump and a fossil power heat generator operate in parallel through a superior control system. With this solution the heat pump (incl. source) must not be dimensioned for maximum performance and the heat generators can run more efficiently (for example with regard to the operating costs or primary energy consumption). 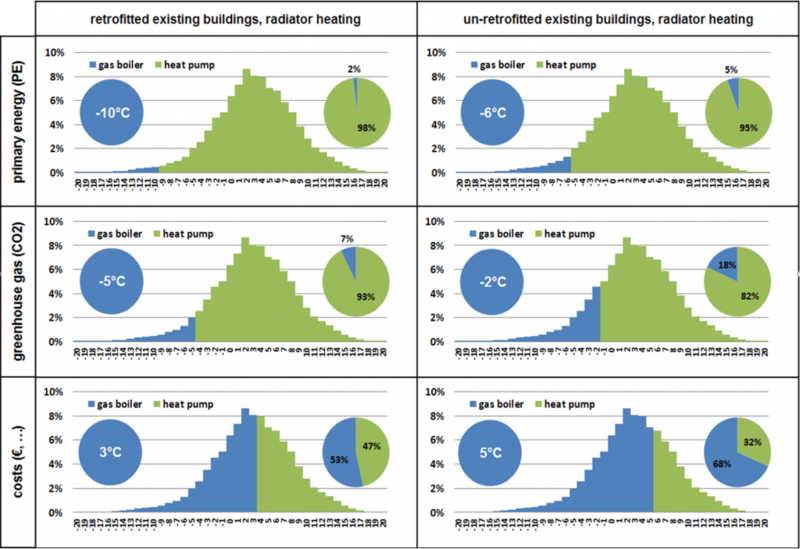 Bivalent temperatures and shares of the heat generators gas boiler and heat pump in covering the heat load under variation of use (renovated or non-renovated existing buildings) as well as the optimisation objectives (primary energy consumption, CO2 emissions and consumption costs); results of simplified, static calculations.